This listing is for a round gray background and white letters decal that is single-sided. 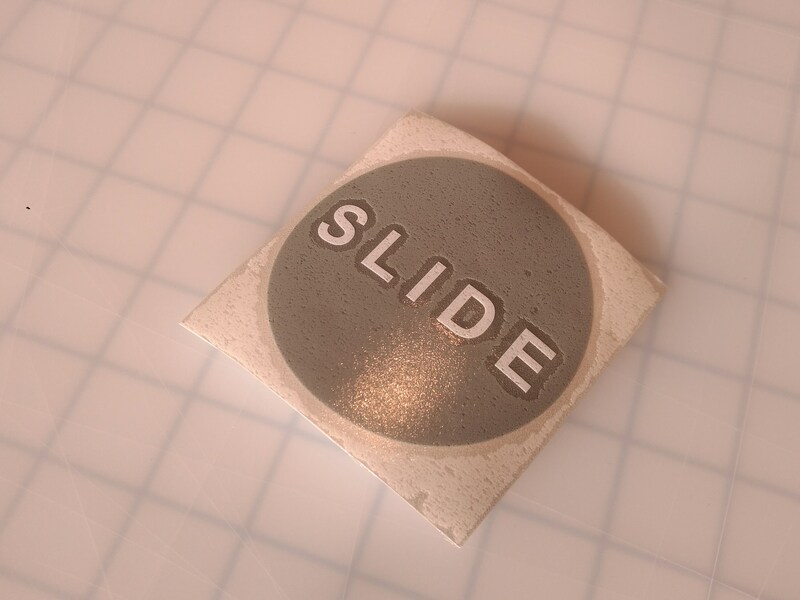 An order consists of 1 decal that says slide on one side. Do you have to clean a lot of slobber off of your glass doors because people need to slide the door open? I can help. With this Slide vinyl decal, you will save on trips to the hospital, maybe. This vinyl sign is easy to affix to any window or glass door front. Easily removable but not reusable. Size is 3.25" x 3.25"
ANY SIGN CAN BE CHANGED INTO ANY OTHER LANGUAGE. Please convo. CUSTOM: We can do custom sizing on all signs in our shop just for you! Just send us a convo with the size you need to fit your space and we can give you an adjusted price. SHIPPING: Most items ship within 1-3 days of an approved payment. We ship 1st class USPS or parcel post mail depending on weight in the 48 states and Canada. Convo me for Priority Mail, Insurance and International rates. RUSH: If you need your item to ship in 24 hours or less l charge you a Rush charge and you will become my next customer. *** USPS offers the most competitive shipping rates saving you, the customer, approximately 50% on shipping costs compared to alternative methods such as UPS or FedEx. Although most orders are delivered on time, USPS can be unreliable at times. A Sign of Success cannot be held responsible for USPS processing, tracking, or delivery delays. Upon request, shipping via UPS or FedEx can be accommodated for an additional fee. Please use this option if your order is needed by a specific deadline. Thank you! PAYMENT: We accept PayPal and credit cards. BULK ORDER: We discount for bulk orders of more than 10 sets. Convo us with any questions, thank you.